This is one of my favourite artistic images I captured during this Roma's Hospitality Centre wedding photo shoot. In this wedding photo, the bride, placed on the right of the frame, is presenting the bouquet to the bridesmaids. They try to reach the bouquet but to no avail. What is striking about this images is the intriguing angle from which the photograph was shot and the fact we only see a group of hands reaching for the bouquet. The only face we can see clearly in this image is that of the bride's sister, the one who caught the bouquet in the previous album spread. To create this photograph I had to drop on the ground and from there to direct the girls according to my vision. What I like the most in this image is the angle in the beautiful sky with textured clouds, which makes a perfect backdrop for this wedding photo. Also, the expression of the brides sister is priceless. We can see a smile in her eyes as if she's looking forward to the day when she will be a bride. Because this image was shot perfectly in camera, I did not have to do a lot of work in post processing. I adjusted the exposure ever so slightly in Lightroom and increased the fibrous of the image. Also, increase the sharpness in order to bring out the texture in the clouds. In every image there is something that can be improved. 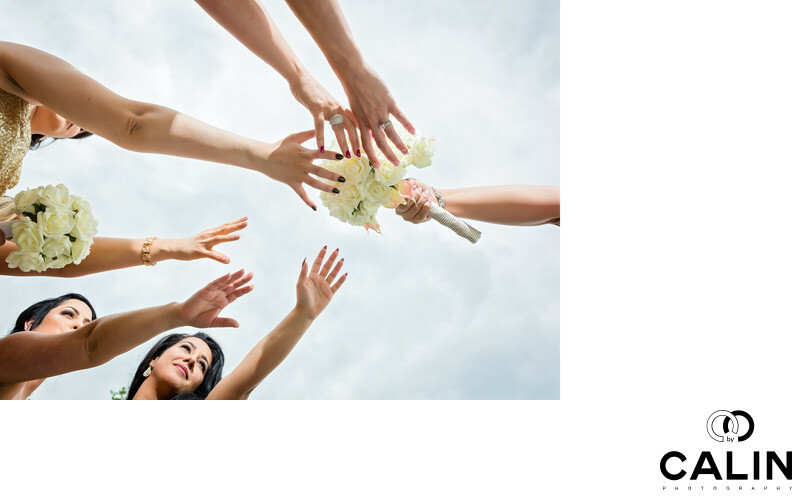 In this one, one of the bridesmaids is holding her bouquet, which defeats the purpose of them reaching for the bridal bouquet. However, despite the fact I could have dropped out that bouquet or could have removed it in Photoshop, I did not. Sometimes, a perfect wedding photo looks fake so often, I introduce mistakes in my frames to make the images look more believable and give them a photojournalistic feel.